The unnamed prosumer version of the F3 that Sony has been keeping under wraps is now semi-official. 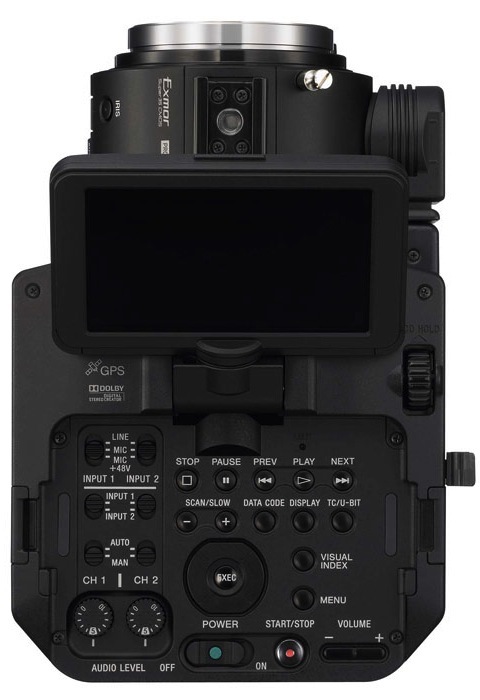 The NEX-FS100 will have the same (roughly Super35-sized) sensor as the F3, offers XLR audio inputs, a detachable viewfinder, a detachable hand grip, up to 1080p/60p shooting, GPS capabilities, and will retail for around $6,000 (including a Sony E-mount zoom lens). Hitting a similar price point as the Panasonic AF100 and, eventually, the RED SCARLET 8X, the Sony will record to an AVCHD codec of up to 24Mbps (28Mbps in 60p), and will offer a 4:2:2 HDMI output in lieu of the F3's 4:2:2 (upgradable to 4:4:4) HD-SDI. No word yet on whether the FS100 will have 10-bit or 8-bit HDMI output, though the HDMI signal will reportedly include timecode. The camera takes SDXC/SDHC or Memory Stick Duo cards, and may retail for as low as $4,500 without a lens. UPDATE: suggested list price for the two different models (the "K" monitor indicates it includes a lens) are as follows: NEX-FS100U (without lens) is $5,850, and the NEX-FS100UK (with lens) is $6,550. However, considering the F3's suggested list price is $16,000 and it's retailing for $13,300, that $4,500 figure is likely spot-on. Fast & slow motion up to 60fps (note: another site claims only 50p) at 1920×1080 HD resolution. It's certainly a new form factor for Sony, veering away from the PD-150/EX-1 camcorder form factor that they've employed for years. With a detachable viewfinder and detachable handgrip, the boxy body seems more akin to a RED "brain" than their traditional video camera. Any thoughts on the NEX-FS100 based on the specs, images, and price? I'd like to see the other side of the camera. IIn one picture it looks like there's a hand grip, and hopefully a zoom rocker switch. I don't see it in the other photos. It looks really good, nice form factor, clean images, ISO 800, s35. I'm in the market for a second camera besides my 5dmkII - however, I am very curious about what the 5dmkIII will offer. For a DSLR guy making money on still photography as well as video, a 5dmkIII with no or slight aliasing and at more than HALF the price would be a selling point for me. things are surely speeding up!! I would expect they will be very simliar to the F3 -- certainly the aliasing, etc. should be the same given it's the same sensor, and i don't expect they'd change the basic image processing from the F3's. Looks very interesting. Sensible feature offering from Sony for a change. Excellent form factor to build an underwater housing around. Its news like this that reminds me how important it is to subscribe to the NFS (not the game) newsletter which I did 6 months ago. Kindly let me know whether proper electronic adapter for Canon EF mount to Sony E mount is available or not. If available what is price in Indian Rupees, and where from I can get it. Then I will think to purchase the Sony NEX FS-100 camera body only, to utilize all my Canon EF series lenses.